Both teams are coming off exhilarating wins – the Hurricanes defeated the Georgia Tech Yellow Jackets on a game-winning field goal and the Orange defeated the reigning champion Clemson Tigers by three last weekend. But now, that all goes out the window. 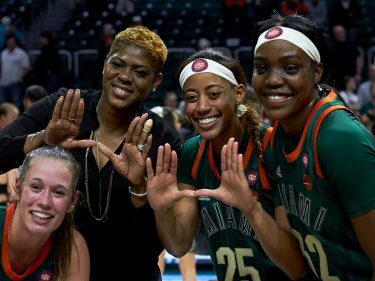 The Canes are trying to remain the only undefeated team in the ACC with goal of a Coastal Division title in sights, while the Orange are trying to beat back-to-back top-10 teams for the first time in their history. 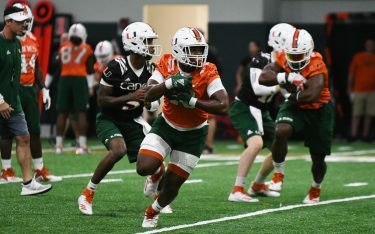 Cuse runs a fast paced, uptempo style offense with two of the best receivers in the country, so Miami must do two things – maintain its conditioning on defense to avoid big plays and get off to a much quicker start than it has in the past two weeks. Miami will run out the clock and close out the win 27-19. Syracuse can’t convert on 4th down. Miami ball. Travis Homer finds open gap for 33-yard rush down the middle for the touchdown. Hurricanes up on Orange 27-19. 2:48 left for Syracuse to counter. Cuse hits 53-yard field goal. Canes still up 20-19 with 5:23 left in the final quarter. Miami goes for it on 4th-and-3 on the Syracuse 31-yard line. Rosier’s pass too low for receiver Darrell Langham – Canes can’t convert. Syracuse ball. Rosier to Richards – 26 yards to Syracuse 38-yard line. Syracuse hits 45-yard field goal to make the score 20-16. Miami still up with 9:52 left in the contest. The Orange try a flea flicker that fails. 4th down. Big 3rd-and-goal coming up for the Orange. Rosier looking for Richards deep, throws pass short. Incomplete. 4th down. Running back Moe Neal rushes for 15 yards and the touchdown. Canes still up 20-13 with 1:08 left in the 3rd quarter. The Orange scored in under 2 minutes. Hurricanes might have fallen asleep on that drive. Dungey showing off his legs – rushes of 28 and 14 yards. Rosier finds wide open freshman receiver Jeff Thomas for 48-yard touchdown. Thomas ran right around his defender with ease at the line, and it was over from there. Too fast. Hurricanes up 20-6 with 2:51 left in the 3rd quarter. On another 3rd-and-10, Syracuse chooses to run the ball. No gain. Cuse punts. Impressive play by Dungey. On 3rd-and-10 while backed up on own end zone, Dungey steps forward and rushes for 18 yards and the 1st down. Another great punt by freshman Zach Feagles. Ball down at the Syracuse 2-yard line. Interesting play call – Miami runs the ball on 3rd-and-6 with the team not in field goal position. Homer can’t get the 1st. Canes punt. Orange kicks 40-yard field goal to make the score 13-6 with the Canes up at the 8:55 mark of the 3rd quarter. Dungey’s pass incomplete looking for Ishmael on the sideline. It would have been 1st-and-goal if he had caught it. 4th down. Strickland continues to be the only Syracuse player to consistently pick up yards on Miami – 27-yard rush there. Receiver Steve Ishmael is back on the field and playing. Rosier has started the second half the same way he started the first – looking for his tight end Herndon. Canes linebacker Michael Pinckney gets his second sack of the game. He has been locked in. Dungey has been awful. That was his fourth pick…and we are still in the first half. First time player gets Turnover Chain TWICE in one game – Hurricanes defensive back Michael Jackson with his second interception. On 4th down, UM punts to the Syracuse 2-yard line, giving the Orange very difficult field position. Rosier perfect pass to the Ahmmon Richards Canes fans all know and love – 31-yard completion. Hurricanes in Orange territory. Syracuse scores its first points off a 22-yard field goal. Miami up 13-3 with 6:19 left in the 2nd quarter. On 3rd-and-goal, receiver Ishmael can’t hang on to pass. Incomplete. 4th down for the Orange. Ishmael is hurt on the play and gets help off the field. Linebacker Zach McCloud with nice tackle on Strickland, but he still gains 1 yard. 1st down. 3rd-and-1 on the Miami 7-yard line for Cuse offense. Will they score? Only Orange momentum on offense has been on the ground – Strickland rushes for 20 yards and the 1st down. Hard to tell if Dungey has been that miserable of a passer, or if Miami pressure has just been that good. Probably a little bit of both. Dungey is 2-13 for 19 yards passing and three interceptions. No touchdowns. QB rating of -18.5. Canes settle for field goal – 39-yarder by Badgley. Canes up 13-0 at 10:41 mark of 2nd quarter – have scored twice off turnovers. Another drop for Richards…he is getting past his defender with ease, absolutely smoking him. But just can’t hang onto the ball right now. Defensive back Jaquan Johnson with the interception off another head-scratching pass by Dungey – might have been a possible miscommunication with receiver. He is struggling immensely to find his targets. Rosier is really feeling comfortable with Herndon right now – throws to him again for the 10-yard touchdown catch. Miami now up 10-0 on Syracuse at the start of the 2nd quarter. At the end of the 1st quarter, Canes are up on the Orange 3-0. Miami on the Syracuse 15-yard line in position to score for the second time. Drops have been a problem early for Hurricanes offense, but tight end Christopher Herndon was just too open right there. 35-yard completion. Rosier finds Homer, who explodes to the right for 24 yards. Drops have been a problem for Canes early. That time it was Homer. Dungey intercepted by cornerback Michael Jackson on the first play of the drive. Hurricanes regain possession and Jackson gets the Turnover Chain. Not a good punt for UM. It goes just 25 yards to Miami’s own 38-yard line. Good field position for Syracuse offense. Rosier can’t complete pass on 3rd down. He was looking for his tight end Christopher Herndon, but the ball got deflected. Miami punts. Rosier rolls to the right and finds a wide open Ahmmon Richards near the sideline…but Richards drops the ball. Some problems early on holding onto the ball for the All-ACC receiver. UM gets the stop – running back Moe Neal rushes up the middle for 5 yards but is short of the 1st down. Syracuse punts. Hurricanes defense continues to get pressure. Linebacker Michael Pinckney with the sack to force a 4-yard loss. On 3rd-and-4 for Cuse, Dungey finds one of his two most reliable targets – receiver Steve Ishmael wide open down the middle for 12-yard gain and the 1st down. Orange showing early and often how fast they run their offense – constant hurry-up. Senior Michael Badgley kicks 18-yard field goal to give Hurricanes early 3-0 lead at 7:25 mark of 1st quarter. On 3rd-and-goal, looks like Rosier throws perfect slant pass to receiver Richards, but he just can’t hang onto it all the way through. Great play by Orange defender. Miami needed to get off to a faster start on offense against Syracuse – the team is doing just that so far. Rosier rushes for 9 yards and gets into the red zone. Safe to say quarterback Malik Rosier is happy to have Ahmmon Richards back – completes a 15-yard pass down the middle. Sophomore running back Travis Homer still looks good – rushes of 9 and 7 yards for the first down. So close…on third down for Syracuse, Dungey’s arid pass almost intercepted by defensive back Michael Jackson, but he drops the ball. Cuse punts. Bright side for the Canes – they are getting early pressure on Orange quarterback Eric Dungey. Another early breakdown for Miami’s defense, allowing a 24-yard run to Syracuse running back Dontae Strickland.